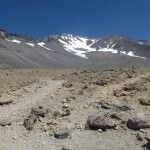 The route (pdf) has four legs: South Lake to Red Lake, Cottonwood Lakes to Shepherd Pass, White Mountain, and Mount Shasta. The first Sierra leg covers the northern peaks, from Thunderbolt to Split, while the second covers the southern ones, from Langley to Tyndall. I believe my route is close to optimal for all but the fastest trail runners. The two Sierra legs are by far the longest, and doing them back-to-back is the route’s greatest challenge. The Thunderbolt-to-Split leg starts at South Lake, taking Thunderbolt Pass to Southwest Chute #1 on Thunderbolt. 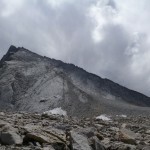 From there, it traverses to Sill, then drops down the southwest side, where it continues south over Cirque Pass to the west side of Middle Palisade. 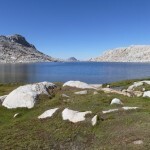 After climbing and descending the notorious Farquhar route, it crosses Mather Pass on the JMT, leaves to climb Split, then descends the standard route to Red Lake. After an opportunity to nap on the car shuttle, the Langley-to-Tyndall leg starts at Cottonwood Lakes, taking Old Army Pass to Langley. 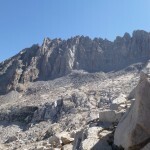 From there, it drops into Rock Creek, climbs Crabtree Pass, and joins the Mount Whitney Trail at Trail Crest. Tagging Muir on the way to Whitney, it then drops down to Whitney-Russell Col and up Russell’s south chute. From Russell, it descends the north ridge, passes Wallace Lake, and climbs Vacation Pass to “Barnard East” and the Barnard-Trojan talus plain. 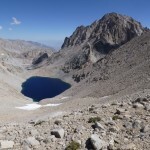 It then drops to Lake Helen of Troy, climbs the standard route on Williamson and the northeast rib on Tyndall, and descends via Shepherd Pass. After another possible nap, it climbs White Mountain from the Barcroft gate. 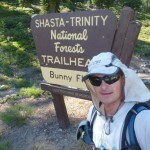 The long drive up to Shasta allows a full “night’s” sleep before the final 7,000′ climb from Bunny Flat. Some days everything comes together; this was one of them. After dinner in Bishop, I drove to South Lake, set my alarm for 2:40 AM, and (amazingly) managed to get to sleep around 9:00. I woke up before 2:00, too wired to get back to sleep, and used the extra prep time to eat my normal granola and coffee, pound a half-liter of beet juice, and brush my teeth in preparation for three days of sugary abuse. After a laugh at the Soviet Realist how-to-poop-in-the-woods sign, I took the photo that started the clock, and got to business. I made good time up Bishop Pass, jogging some of the flat sections, nailed the traverse to Thunderbolt Pass, and reached the summit block at sunrise. I was prepared to aid it with my 20m rope, but decided to try free-climbing it first, so I strapped the rope on my back and put my camera in my pocket. I felt solid boosting onto the first ledge and, after psyching myself up, mantled onto the upper slope and found purchase to scramble to the summit. Go me! After taking a couple of pictures, I threaded my rope through a ‘biner and lowered myself hand-over-hand. Psyched up by having reached Thunderbolt quickly and free-climbed the block, I continued to Starlight, easily climbing up and down its “milk bottle” summit block. At the gap between Starlight and North Palisade, the long sling I found several years ago was gone. I chimneyed down into the crack, tossing my pack across the gap, but chickened out at making the jump, afraid I would catch some part of myself in the crack. Climbing back up, I made my way down the north side of the ridge, into the gap, and up the big flake to the platform on the other side, retrieving my pack. After tagging North Palisade, I made a quarter-hearted attempt to find the Clyde Variation into the U-notch, then just downclimbed the 5.4 chimney. Crossing Polemonium, I found the knife-edge much less impressive and intimidating than I had when doing the traverse in 2008. Four years and three dirtbag summers have improved my confidence. They have also given me speed: having reached Sill in 9 hours in 2008, I took just 6 in 2012. 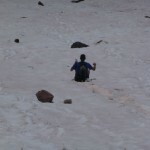 Along the way, I passed two young women heading up from the Palisade Glacier toward Polemonium. Dropping straight down to the valley, I headed south over mostly good talus (I only fell once) along the western edge of the Palisades, past Potluck Lake and over Cirque Pass. 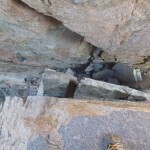 After crossing pleasantly slabby terrain south of the pass, I studied the confusing west side of Middle Palisade, and chose what I thought was the Farquhar Death Chute. Partway up, I realized I was one chute too far south, but by making an ascending leftward traverse, I reached the ridge north of the difficulties between Disappointment and Middle Palisade. Actually, my path was more pleasant than the Farquhar route, and probably no harder than 4th class. From the summit, I saw a helicopter searching both sides of the ridge; from one of the two men I met there, I learned that it was searching for the body of Gary Dankworth, who fell on Norman Clyde. After dropping down too early and having to backtrack a bit, I found the actual Farquhar route on the way down, and it absolutely lived up to its lousy reputation. There’s no reason to use this route unless you’re trying for the record. 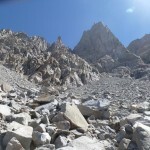 I made my way more-or-less straight down to the JMT, and was glad for a return to the company and mindlessness of trail-hiking. 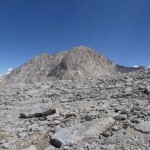 I met a large group stopped on Mather Pass, one with a ukulele, and experienced the culture clash as I explained what I was doing and learned how many days they planned to spend on the way to Whitney Portal. I ran the south side of the pass, then took off east from the base, skirted a lake, and scrambled up the long talus slope to Split. My climbing performance was slower but acceptable. I called Mike from the summit, then face-planted going down the talus, cutting my chin and nearly losing my phone (disaster!). Fortunately, I was ahead of schedule and descending during the day, so I quickly corrected my mistake after blowing by the non-obvious turn into the Red Lake drainage, and had no trouble following the terrible trail. I barely resisted the urge to booty an ice axe hanging in the bush maze. Mike and I reached the trailhead at the same time, and I refueled on salty food, Gatorade, and beet juice on the rough drive back to the Glacier Lodge road, then climbed in back for some horizontal non-sleep. Some days you simply endure; this was one of those. I expected to finish the first leg late at night, and start this one shortly after midnight. However, we pulled into Cottonwood Lakes at dusk, and I got a full 9-hour dose of headlamp time. This cost me some time between Langley and Whitney, as I had not planned to do this section at night. However, the full moon helped, and finishing during the day reduced the effects of sleep deprivation. Langley via Old Army Pass was straightforward, and I even managed to jog some flat parts of the trail, but I started eying sleeping rocks around 10:45. I downed a few caffeinated gels, and felt much better for awhile. I missed the trail in Rock Creek, found it again near Sky Blue Lake, and somehow managed to take a less-direct line to Crabtree Pass, passing a small lake to its southwest. Scouting this section in 2009, I had managed to traverse the loose talus and ribs below McAdie during the day. However, I decided it would be easier by moonlight to take the standard route down the other side of the pass and up the “dreaded sand hill” below Discovery Pinnacle. After dropping down, I found a trail east and north around the lake, then headed up west of the cliff band. The sand hill was long and nasty, and I started feeling nauseous, making it feel longer. I ate what I could — a bagel and some non-caffeinated gels — took a 10-minute nap, and doggedly made my way to Trail Crest. 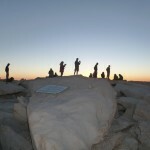 Forgetting which insignificant point was Mount Muir, I took another 10-minute break along the trail, watching a surprising number of hikers make their way to the summit to watch the sunrise. 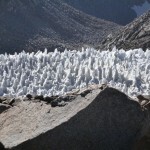 I eventually continued up the trail, found the obvious turnoff to Muir, and made it to Whitney’s summit with the sun. I have never taken the same route twice on Whitney’s north side, and have always ended up well west of the path up Russell, so I decided to drop down the Mountaineer’s Route and up Whitney-Russell Col, possibly costing me a few minutes. The Mountaineer’s Route was fast enough on the way down, but was surprisingly loose and lousy for a popular and well-traveled route. I finally began feeling better and eating more, and kept a decent pace up Russell. From Russell’s summit, things look grim. Williamson looks distant, with serious obstacles in the way. The route I chose as least-bad drops below 12,000′, then climbs above 13,000′ before dropping into the Williamson Bowl at 12,500′. I made my way toward Wallace Lake near the ridge south of Carl Heller, then managed to find a traverse across to Vacation Pass, saving myself a few hundred feet of climbing. 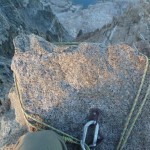 Like Barnard, “Barnard East” is cut in a way that you almost have to go over its summit to avoid cliffs. I doggedly made my way just east of the top, then crossed the high plateau to the Barnard-Trojan saddle, contoured around north, and descended to Lake Helen of Troy. Though it is a nice-looking lake, Helen of Troy is a bad place for humans. The route to its west is blocked by cliffs, and most of the shore is loose talus extending down to (and, as I found once, below) the waterline. It is also home to swarming talus gnats, who attacked me every time the loose rocks shifted and swarmed me as I refilled my water bladder. I made my way around the east shore as fast as I could, then sat well away from the lake to have a sandwich and check out the route up Williamson. Reaching the flat part of the Williamson Bowl, I found it much more pleasant than I remembered, with its talus more stable and the climb out to the north shorter. I was anxious about the clouds forming over Tyndall and nowhere else — what a pathetic way to end my record attempt! — but there was no lightning yet. I started up Tyndall’s northeast ridge, stopping occasionally to eye the clouds or double over in a coughing fit. 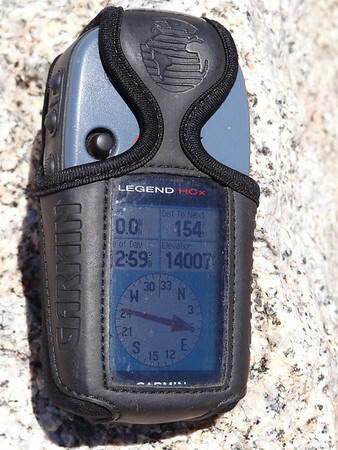 Following a well-worn trail, I reached the ridge north of the summit, then boulder-hopped south, reaching the summit with much relief and more coughing. 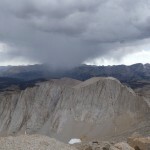 The clouds had moved west to rain on the JMT. After calling Mike from the pass, I descended as quickly as I could. My feet had swollen so that my toes bumped the front of my shoes with every step, but jogging was no more painful than walking. 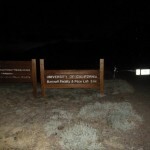 Going up the monotonous, sandy climb to the Symmes Creek saddle, I finally began to feel the effects of sleep deprivation: with nothing to focus on, I experienced several microsleeps. The final descent held an unpleasant surprise: someone thought Shepherd Pass had too few switchbacks, and added more long, sunny, nearly-horizontal ones. Hikers rarely shortcut the old trail, but the new one is too absurd, and I was able to find numerous use trails. 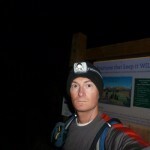 I mentioned my strange quest to a couple of backpackers, one of whom seemed to appreciate it, even taking a short video to document my attempt on the FKT site. The industrious trail workers hadn’t gotten around to adding footbridges over the creek, but it was low enough to make the crossings trivial. Mike met me at the trailhead with more Gatorade, half a pizza, and some M&Ms. Few things are more absurd than walking up a road through a desert wasteland in the dark. Fortunately, Mike was willing to hike the White Mountain road with me, past the horrible-smelling sheep pens and over the scree to the building at the summit. While this leg was much easier than the last one, it made me less motivated, and I was glad to have some company. 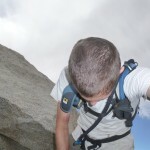 Though I did not feel tired on the hike, I began falling asleep mid-sentence on the drive down to Bishop. My dad took over the driving around 3:00 AM, and I finally managed to sleep. I woke up somewhere between Reno and Susanville, and stayed mostly awake from from there to the town of Mount Shasta, eating random food and rehydrating. When I hit the trail at Bunny Flat, I felt surprisingly energetic, my knees and legs were only moderately sore, and my appetite was almost back to normal. 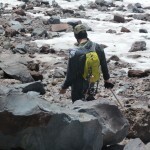 Cruising up the trail and then the snowfield below the Red Banks, I saw the usual variation in gear on a popular peak, from some guys walking down low-angle scree with helmets on and ice axes in hand, to a man carefully glissading in shorts with a water bottle in either hand. The latter apparently summited in under 4 hours, despite having to climb the scree on the way up. The standard route was as painful as usual, and much drier than last year, but my body was producing all sorts of endogenous drugs. I hit the summit in 3h30 from Bunny Flat, then glissaded and ran back down to hit the trailhead in 5h20, faster than I climbed it fresh last year by 5 minutes up and 40 down. This would not have been possible without others’ support. 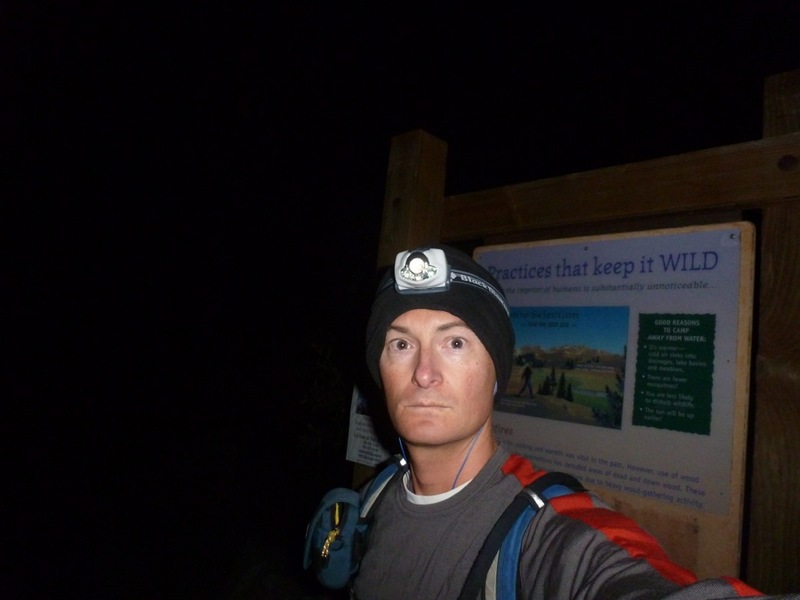 My longtime friend Mike provided encouragement and nutritional advice, and came out to California to drive the night-time car shuttles and hike with me on White Mountain. My dad drove the long shuttle from Bishop to Mount Shasta. I originally planned to pack 250 calories per hour on the trail, mostly carbohydrates in the form of generic pop-tarts (1710 cal/lb, 1600 cal/$) and energy bars (1540 cal/lb, 250 cal/$). After consulting with a friend, I increased this to 300 cal/hr: one pack of pop-tarts and two energy bars for every three hours, plus an assortment of gels (100 cal/$). My actual eating did not follow this plan. I felt best eating a bit more than 350 cal/hr on the first leg. Nausea and dehydration on the second leg limited my food intake, as I could not stomach pop-tarts. I also brought Payday bars and turkey-and-cheese bagels on some legs for variety. I brought salt pills and ibuprofen on all legs, which I used as needed. For the sleep-deprived second and third legs, I brought the caffeinated versions of energy bars and gels. I drank beet juice before each leg, since its nitrates are supposed to increase performance by about 2%. I ate salty, greasy, high-energy “real food” between legs, including half a pizza, several turkey-and-cheese bagels, and some leftover noodles, cabbage, and cottage cheese. I was mostly equipped with standard hiking gear. For footwear, I wore a pair of light trail runners (La Sportiva Quantums, which I once again destroyed) for all but White Mountain, when my feet were too swollen. I brought a 20-meter rope for Thunderbolt’s summit block, and a mountaineering axe and Kahtoola KTS aluminum crampons for Shasta. 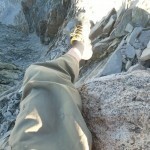 Josh Swartz climbed all 15 14ers completely self-supported in 5d23h31m. Being self-supported, he could not use point-to-point routes, and could not sleep during drives. 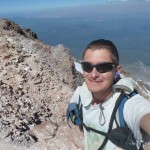 Jack McBroom climbed all 15 14ers in 4d11h19m with support. Although he could use point-to-point routes and sleep in the car, he divided the route into more sections than necessary, requiring more approach mileage. While McBroom has the actual record, Hans Florine’s time of 3d12h11m for 14 of the 15 14ers is the best model of what is possible. Florine combined the peaks in the fewest possible legs, and his southern Sierra leg can easily be extended to cover the last 14er (Williamson). We whistle while we “waste”! Sean- this is very impressive! I totally feel your pain about Lake Helen of Troy – it was a horrible experience for me a few weeks ago. Thanks! Had I known how awful it was, I might have looked more carefully for an alternate route, but that’s a hard part of the Sierra to cross. Thanks. I hope it inspires you to get out there and do some big day-trips. Really, really awesome. Nice write-up too. Thanks! I added some map links to help visualize the first two legs. Thanks! I hadn’t done something on this scale before, so I was impressed that I held up as well as I did — I should be out running again tomorrow. Excellent job! Very inspirational story .. Would love to try this sometime .. Hats off to you….. Thanks! I hope you give it a shot, and find a better way to do my second leg. Great Write up! Big Congratulations Sean! Awesome Sean. I traversed the West side of Lake Helen a few weeks ago – that sucked too, but it went. The Sierra Challenge should be a nice cool down after this. Thanks! Looking forward to seeing you again at the Challenge this year. I’ll try to take it easy, but I’m sure I’ll find ways to get my hurt on. Big congratulations and huge props. A bold objective done in impeccable style! Self abuse at its very best. want to try Rainier/Adams/Hood in under 24hrs? I’m looking for a partner – can’t get a permit for Rainier without one. conditions are good now, though Hood is starting to melt out. Tempting… I got denied for a Rainier solo permit this year, and had planned to just solo some other glaciers and come back. Drop me an email. Awfully impressive as well as inspiring. Two friends and I are doing the T-bolt to Sill traverse this weekend, and now we’re thinking we need to add beet juice to the menu! Thanks, and have fun up there! I wouldn’t worry too much about the beet juice, though. It’s apparently a 2-5% boost, which is pretty small compared to just being mentally focused and making good route-finding choices. Done your second leg as separate trips… have always wanted to link them up… figured it would take multiple days… motivated to give it a try as a single push during the next full moon). Definitely providing the inspiration/motivation to get out there and push a little harder… Thanks! going to do it again when Barnard gets re-classified as a 14er? out the new route over Vacation Pass. Done your second leg as separate trips… motivated to give it a try as a single push during the next full moon). The Palisades are my nemesis, so I’ve avoided the area for a number of years, although I did ask Myles Moser if he’d do the Palisade Traverse (to Polemonium) with me this summer. Never bothered to set a date. Continuing on to Middle Pal and the Split? 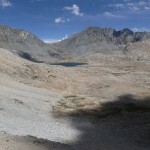 That’s a whole lot of unfamiliar terrain, at least until the Mather Pass area. Shuttles aren’t an issue for me; I have a truck and several motorcycles that I’ve been leaving all over the Sierra this summer. We were lucky that last year was a big snow year. When we did Whitney Portal to Shepherd Pass at this time last year, there was a nice snowfield at Lake Helen of Troy that made the contour around it very simple. I could imagine how bad it is as a talus/scree traverse. Maybe swim across? :-) Seriously, thanks for the heads-up. (I haven’t a clue, but I’m guessing it would be all class 2 terrain. Also guessing that it would add some distance, but if it’s the kind of terrain that you can keep moving on… I guess I should plan on heading over for a recon before committing to the Cottonwood Lakes start.) Any thoughts on crossing Barnard into Wright Lakes, up Tyndall from the southwest and then down the North Rib to get over to Willy? The terrain between Sill and Mather Pass is straightforward except for finding the Farquhar route (or some other suitable way up Middle Pal). Being comfortable on and familiar with T-bolt to Sill is necessary to make this a reasonable day, so I’d do that by itself first. Any thoughts on crossing Barnard into Wright Lakes, up Tyndall from the southwest and then down the North Rib to get over to Willy? It looks like there is a good crossing of that ridge short of the JMT, and you could (I think) drop down Williamson into George Creek to save some time and avoid another crossing of the Bowl. I’d try it. I like the idea of dropping down to George Creek. 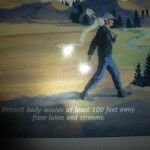 It’s gotta save a lot of miles compared to going down via Shepherd Pass. Only thing is, I don’t know the route. Maybe that’s a good reason to participate in at least one day of SC ’12. Thanks! It was a good test, and mostly fun. Sean, magnificent feat of endurance, power and skill. The olympians have nothing on you! Congrats on the SC2012 victoiries as well. Aw, shucks, thanks. It was fun hiking and hanging out with you at the Challenge. See you next year? Thanks! I didn’t meet Ian, but there seemed to be several paths on the traverse to Islip. I didn’t quite get to Iron — after getting to Baldy via Pine and Dawson, it looked like more than I wanted — but probably will this season. 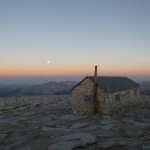 Maybe we’ll cross paths again in the San Gabriels. So sick. Thanks for the thorough write-up, very inspiring and thought-provoking!